Play the upcoming Kingdoms of Amalur: Reckoning demo and you'll unlock a pair of unique, Todd McFarlane-designed items in Mass Effect 3. Coming January 17, the demo for 38 Studios' Kingdoms of Amalur: Reckoning will allow players to customize their heroes and play through the game's tutorial mode, and then drop them into the game world for 45 minutes of exploration. But there's more than just a taste of a new RPG setting on offer, as playing through the entire demo will also unlock a bunch of unique items for use in the full game - of Mass Effect 3. The demo will unlock three Kingdoms of Amalur items too - the Twist of Fate card, the Twinned Souls Chakram and The Infernal Helm - but what I find interesting is the connection with the new Mass Effect. Which is absolutely zero, aside from the fact that both games are being published by Electronic Arts, but here we are anyway. Players of the demo who then take to space aboard the Normandy will find themselves equipped with the Reckoner Knight armor, which improves both close-quarters and ranged damage, and the Chakram Launcher, which uses a built-in fabricator to manufacture lightweight, explosive discs, and presumably fires them as well. The crossover promotion works both ways: playing the Mass Effect 3 demo will unlock a pair of items in the full version of Kingdoms of Amalur: the N7 Armor, a set of helm, cuirass, gauntlets, chausses and greaves inspired by Commander Shepard's space duds, and the Omniblade Daggers, which I imagine are punch daggers reminiscent of those silly holographic blades that poke out of Omnitools. I suppose there are worse ways to drum up interest in a new franchise than by hitching it one that's already well-established and massively popular, but it all feels very awkwardly forced to me. Pseudo-medieval spacesuits look a little ridiculous too, although I suppose that's largely a matter of taste. 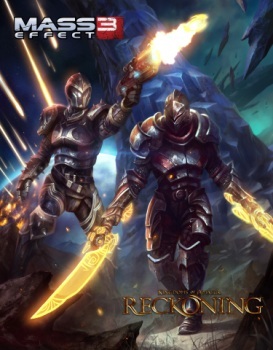 In any case, the Kingdoms of Amalur: Reckoning demo will show up on January 17, so you might as well give it a go; the full version of the game comes out on February 7, while Mass Effect 3 launches on March 6.